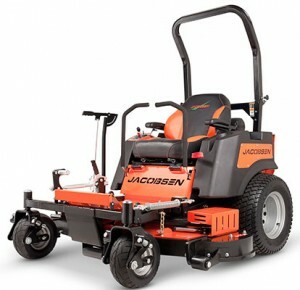 Jacobsen, a Textron Inc. company, recently announced the launch of the all-new Professional Series commercial-grade mowers and utility vehicles. The flagship of Jacobsen’s new Professional Series is the RZT line of ride-on zero turn mowers, which provide the power and performance to handle any turf job with ease. The RZT mows up to 5.3 acres per hour with either a 25 or 27 horsepower Kawasaki FX engine or a fuel efficient 27 horsepower Kohler EFI engine. Offered in two cutting widths (50″ and 60″), decks easily tackle large volumes of grass and provide a more attractive after-cut appearance.